DOCTOR WHO ADVENTURES. VERY GOOD CLEAN CONDITION NEAR MINT. 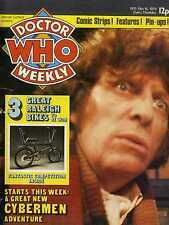 The title changed to Doctor Who Monthly with issue 61 and The Official Doctor Who Magazine with issue 85 in February 1984. 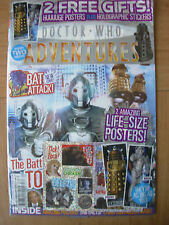 The magazine has remained under that title ever since, although an exception was made for issue 397 in June 2008 when the cover only featured the words Bad Wolf following transmission of the Doctor Who episode ". DOCTOR WHO ADVENTURES. ISSUE No 11. WITH FREE GIFT PENCIL AND ERASER SET STILL SEALED. DOCTOR WHO ADVENTURES. ISSUE No 12. DOCTOR WHO ADVENTURES. 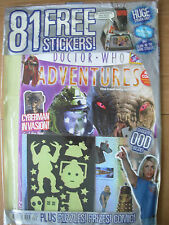 WITH FREE GIFT 81 STICKERS ON LARGE SHEET PLUS HOLOGRAPHIC AND GLOW-IN-THE-DARK STICKERS STILL SEALED. VERY GOOD CLEAN CONDITION NEAR MINT. DOCTOR WHO. Issue Number 11 - 24th August to 6th September 2006. This magazine is in very good condition with only signs of very light use. 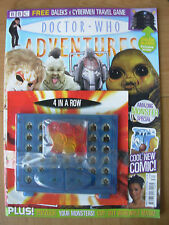 SO SEE MY OTHER DR WHO MAGS. WITH THE FREE GIFTS INCLUDED. GREAT COLLECTORS ITEM IN FAIR CONDITION. 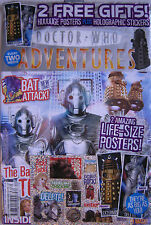 SO SEE MY OTHER DR WHO MAGS. GREAT COLLECTORS ITEM IN FAIR CONDITION. WITH THE FREE GIFTS INCLUDED. 2 Pencils & 4 Alien Rubbers. DOCTOR WHO. Issue Number 12 - 7th to 18th September 2006. This magazine is in very good condition with only signs of very light use. 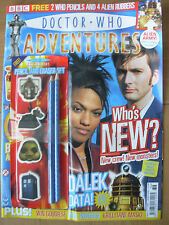 SO SEE MY OTHER DR WHO MAGS. GREAT COLLECTORS ITEM IN FAIR CONDITION. 3 MAGAZINES WITH THE GIFTS / STICKERS. YOU GET THE LOT. GREAT COLLECTORS ITEM IN FAIR CONDITION.